eGrabber LeadGrabber Pro Review: "LeadGrabber Pro - Source New Prospect Contacts & Details in Bulk with Automated Web Crawling Software"
We use LeadGrabber Pro as a tool that allows us to source thousands of new qualified prospects each week. It's more cost-effective than purchasing lists and the quality is much more accurate. The software is built to provide contact details for companies and contacts we've identified as prospects. It's able to work seamlessly on LinkedIn, ZoomInfo and other similar sites making it an invaluable extension for anyone looking to make new business connections with those they've identified online. LeadGrabber is a major contributor to our initial contacts, appointments set and overall revenue generation. I wouldn't want to be working without it. LeadGrabber Pro is well suited for (1) identifying target companies using LinkedIn, ZoomInfo or other similar sites, (2) you then have the ability to build lists of targeted contacts within the tool using those sites, (3) afterwards, the software collects the contact details of those targeted in an effortless, automated fashion, and (4) LeadGrabber Pro provides this functionality at a very cost-effective price point. eGrabber LeadGrabber Pro Review: "It's very very good!" I use LeadGrabber Pro to build bespoke marketing lists for my clients. As opposed to purchasing lists from third parties, LeadGrabber Pro gives me the flexibility to respond to customer needs across geography, industry and job function. Flexibility is a major strength - no obvious weaknesses for me! eGrabber LeadGrabber Pro Review: "eGrabber LeadGrabber is well worth grabbing." Very good software tool for building professional business leads and capturing their contact information. Excellent training and ongoing support from a dedicated team that wants you to be successful with their product. I do recommend the product if you are seeking to build your prospects list from LinkedIn and information found on the world wide web. Look up and filter leads in LinkedIn, then find their contact information, download and import into your database. Some simple step-by-step instructions would be helpful. They may exist, possibly on their web site, but I haven't been offered them. Good product for entrepreneurs and business development professionals who understand the value of LinkedIn. eGrabber LeadGrabber Pro Review: "LeadGrabber Pro saves lives"
I have been using LeadGrabber Pro for two years, and I just renewed for a third year. I use it ~ weekly to collect my contacts' information, and I occasionally help my clients and referral partners build prospect lists with this tool. The Auto-Split function is not perfect ... for splitting large searches into smaller jobs. Occasionally I encounter something trivial that does not work, but eGrabber Tech Support is very responsive, and they issue a patch, within a day or two of my complaint. Great for appending email addresses, phone, and mailing address to lists acquired from other sources. Just import from Excel, and click on "append". eGrabber LeadGrabber Pro Review: "LeadGrabber Pro - The Most Effective Tool For B2B Prospecting"
We use LeadGrabber pro in the Marketing Department to identify potential prospects on Linkedin and find their business contact information. We have a member of our team dedicated to this program full-time and she is able to go in and find targeted prospects then follow-up with them via email or phone in order to introduce them to our company. LeadGrabber Pro is a great lead generation tool. If you know who you want to target, you find people on Linkedin that meets your specific targeting and then capture their business contact information. This information can then be used to send emails or make calls to these contacts. In addition to getting their email/phone number, we are able to capture other important information like their twitter id. This information can be used to better target prospects on social media as well. Leadgrabber has offered excellent support whenever issues have arrived with the system. Though there hasn't been many issues, whenever there has been an issue, their support team has always replied in a timely manner and has also fixed all issues quickly and effectively. Sometimes there are updates in the Linkedin interface which affect how we can search for these prospects through Linkedin. The support team has always been very responsive to help us understand how to better prospect when these updates occur, but maybe receiving an email or some kind of notification in advance would better help us anticipate these changes. LeadGrabber Pro is an effective tool for prospecting for B2B organizations that have a need to prospect a large pool of potential prospects. Within a year period under one license, you are able to find up to 100.000 prospects using Linkedin. This is helpful for organizations who would like to contact many prospects within a year. LeadGrabber Pro might be less relevant for businesses who are more focused on B2C sales or B2B organization that very niche and don't have a large pool of prospects they need to contact. eGrabber LeadGrabber Pro Review: "Excellent Software"
The software is used to generate leads from Linkedin. Lead generation in general for targeted email. eGrabber LeadGrabber Pro: "LeadGrabber review"
I'm using LeadGrabber Pro to source leads. I am able to export data in the way I want. Too many features. It could be greatly simplified. Paying for more AutoNexts when I already paid $4K for the product was excessive. How can I get more data? eGrabber's LeadGrabber Pro is a B2B sales intelligence tool which can be used to build a list of prospective clients from professional networking sites. The tool captures new contacts from online directories as well as professional and social networking sites. LeadGrabber extracts contact information from these websites in a single click, including name, job title, email address, company, phone, etc. and stores these values in a spreadsheet format. But, contacts found online typically lack business email addresses and phone numbers. LeadGrabber appends missing email IDs and phone numbers, which the vendor says can speed up prospecting. The software finds this data using real-time searches on the Internet. 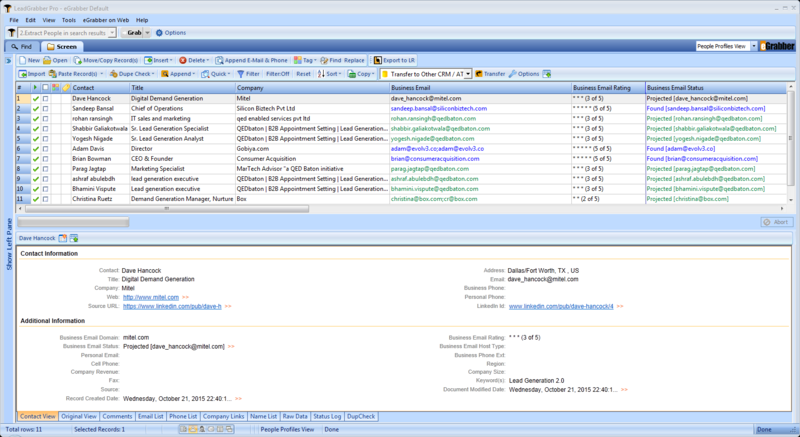 LeadGrabber directly transfers prospect lists to Salesforce.com, PCRecruiter (PCR), ACT!, Excel and Outlook. It also supports CSV format for automatic export of contacts to Bullhorn, Lotus Organizer, Jigsaw etc.